In this woodworking project, I show you how to build an end table from scrap wood! 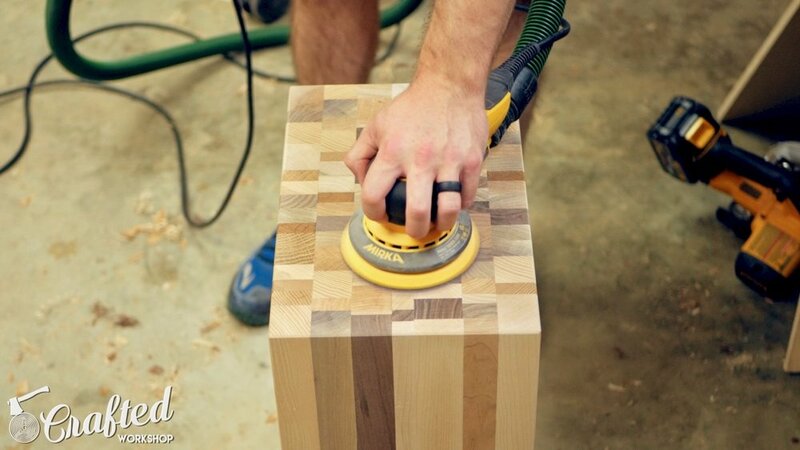 This is basically a really thick end grain cutting board and is a great way to use up those scraps you've been hanging onto. Let's get started! 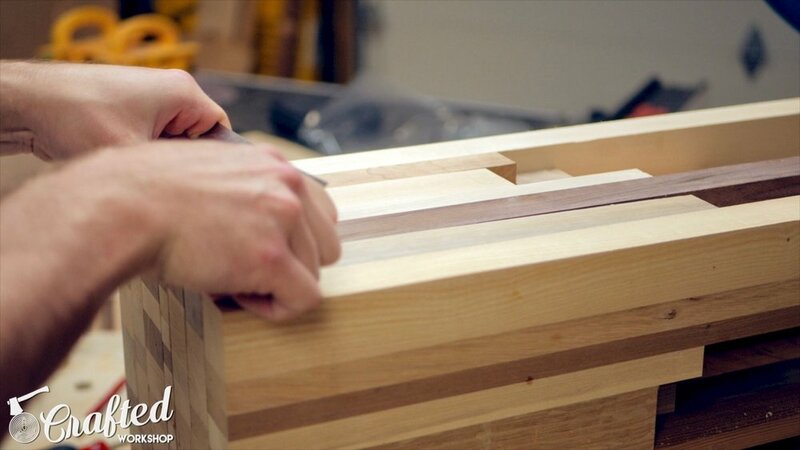 If you’ve seen my video on building an end grain cutting board, this process will look pretty familiar to you. I have accumulated a lot of scrap wood over the past few months and still have some wood from that pile I bought off of Craigslist. After rounding up my scraps, I started cutting them to rough length. The lengths here should be relatively random, as that is part of the look of this table. My end table ended up at about 23 inches tall, so I cut the four leg pieces to that size and then cut the other strips in the 10 to 18 inch range. Once the strips were cut to rough length, I flattened two sides on the planer. This makes sure the strips have a tight glue line when I go to glue them together. With enough strips for one layer cut and planed, I started to arrange them in a pattern I liked. I made sure to alternate wood types, trying to keep things random. The width of each layer was based on the capacity of my planer, 15 inches in my case. After the glue up, these will need to be flattened on the planer, so make sure not to make these layers wider than your planer will accept. Next, I just kept repeating these steps over and over until I had enough layers to make a table. This is a really time consuming process with a lot of repetition, but the end result is pretty awesome and it’s a great way to use up a bunch of scraps. With the first batch of layers arranged, I glued the strips together. One tip here is to make sure the glue isn’t near the bottom edge of the strips, as any of the squeeze out will be nearly impossible to get to and will be visible on the final table. With a few layers in the clamps, I kept working on breaking down scraps, planing two faces, and cutting them to size at the miter saw. I made sure to try and keep pieces of a similar thickness together so less wood would be wasted during the planing step. Once I had a few more layers arranged, I clamped them up and just continued this process until I had enough for my table. After the glue dried, it was time to flatten each layer on the planer. It took quite a few passes on the planer to bring these flat, but I eventually got every layer flattened. As you can see here, the closer each strip is to the same width, the less material has to be removed. Next, I needed to get all of the layers to the same width. I used my jointer to joint one edge and then ripped all of the layers to the same width at the table saw. After getting all of the layers to the same width, I crosscut each layer to clean up the top and to square up that edge. With the layers squared up, it was time for assembly. I used Dominos to help with alignment, but biscuits or dowels would work well for this too. I wanted to reduce as much slipping as I could, since cleaning up the end grain on the top would be a pain later on. Once I had the Domino mortises cut into each layer, I glued them together. Once again, I made sure to keep the glue towards the top half of each layer to minimize squeeze out in the bottom half of the table. I also made sure to focus plenty of glue on the top edges of the table, because I didn’t want any gaps on the table top. After a few hours, I removed the clamps and scraped off any glue squeeze out from the top and sides. Next, I needed to flatten the sides and the top. Since this was too big to pass through any of my machines, I used my trusty low angle jack plane. Since I used the Dominos, I didn’t have much material to remove, but the jack plane made quick work of the material I did need to remove. Once the plane had the sides flattened, I hit all of the sides with a card scraper to really smooth things out. If you haven’t used a card scraper before, get one. They’re an incredible tool for removing tool marks from the surface of projects and they save you a lot of time when it comes to sanding. Next, on the table saw, I crosscut the legs to their final length using my miter gauge. It’s best to wait to do this until everything is assembled so that any slippage during the glue up and can accounted for. Next, I chamfered the top, sides, and feet of the table with my block plane. Chamfering the feet helps keep the feet from splintering when the table is drug across the floor. Next came a lot of sanding. Luckily, the card scraper saved me quite a bit of sanding on the sides of the table, but I still had a good bit on the top. I did roughly flatten the top with my low angle jack plane off camera, but there was a still a lot of work to be done. Sanding end grain is extremely time consuming, and I started with 80 grit and worked my way up to 180 grit. With the sanding done, it was time for finishing. For the bottom of the table, I couldn’t really think of a way to get finish into all of the small areas besides using a spray finish. I used a spray polyurethane for this. For the top and sides, I used a wipe-on polyurethane, and applied three coats in total. I sanded between coats with 400 grit sandpaper. Once the finish dried, I added some felt feet to the bottom of the legs and the table was done. I'm really happy with this finished Scrap Wood End Grain End Table project. It only took me about two days to build and the final piece is definitely a cool conversation piece. You can easily scale the size up and down by adding more layers if you want a bigger table. If you build one, tag me in the photos on social media! To see more woodworking projects, check out my list of projects here. To keep up with my project videos, make sure to subscribe to my YouTube channel here. Thanks, and see you guys next week!